The Eastern Dry Rocks Sanctuary Preservation Area (SPA) is a focused area of reef habitats which includes shallow- to medium-depth areas that are appropriate for diving and snorkeling alike. The depth ranges from five to 35 feet, making the site accessible to divers and snorkelers of all levels. Eastern Dry Rocks is actually a half mile to the east of another preservation area called Rock Key SPA. Rock Key Sanctuary Preservation Area also ranges from five to 35 feet in depth and is one mile to the east of Sand Key Light. Eastern Dry Rocks and Rock Key are both described as containing sandy- and coral-filled areas and canyons that are replete with sea life. You may not take anything from the .1 square nautical mile SPA zone when you're diving or snorkeling in Eastern Dry Rocks; this area is being preserved so that the underwater species inhabiting the area have a chance to thrive. At the southwestern end of the site however you'll find a galleon which is nigh impossible to tell apart from its coral reef surroundings. Divers routinely find artifacts in the area which include brass fittings. There are usually large coral formations near the remains of the galleon as well as lobsters. Eastern Dry Rocks is located at N 24 27.500 W 081 50.440, and is a great site whether you're an advanced diver or a novice. If you don't dive at all, you can still have plenty of fun snorkeling in this spot, so it's a very accessible choice. 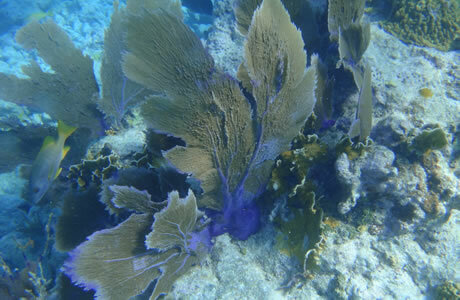 The water is typically quite clear and there are manycolorfulphotos of the reef online. This is a great place to capture some underwater memories of your Key West vacation. Just make sure to familiarize yourself with the rules before you head out since this is a protected area.